Last winter the venerable Toscano’s Trattoria in Comox changed hands. When Chef Kevin Frisch (formerly of Atlas Cafe and Locals) took the helm in the kitchen he told me he was moving beyond “Italian-type” food. His vision: to create a warm, social culinary experienced rooted in the ethos of the slow food movement that animates the “Italian culinary approach.” That means: freshest, closest-to-home ingredients. It means honouring the locale, not a fixed idea of what an “Italian” menu should be. Six months after our conversation, with lots of time to put his plan into play, Chef Kevin invited me to sample a tasting menu. I brought friends, and we spent the better part of four hours enjoying the 10 items he’d prepared for us. Tasting dinners are special events, culinary tours. The kitchen pulls out the stops. Some highlights from our tour: Roasted local beets with Qualicum goat cheese. Chilean-inspired crudo featuring BC tuna. House made spaghetti with carbonara sauce featuring Tannadice bacon. More Tannadice pork. Then some Glen Alwin lamb. Lots of “local” cred. On the wine side, an Okanagan Gamay Noir. At the end, we faced – and finished – a platter of Island cheeses. Throughout our tour we were smacking our lips and telling each other how much we loved this, or that. The tasting menu was fun. But that’s not how I usually eat. I have my comfort foods. The spaghetti carbonara, for example, it touched all of our sweet spots. To the extent that after our Sunday afternoon walk Jenny I had only one thing on our mind: Toscano’s carbonara. As luck would have it, it was Chef Kevin’s day off. If the kitchen could echo our earlier experience, I’d be impressed. I was – but not just by the carbonara. All of our comfort food choices, including the roasted red pepper tapenade with house-made bread to start, through to the dessert, was impressive. Let’s start with the Caesar salad. Toscano’s set a new standard for me. Crisp, but dressed, with “edges” of the garlic, capers, anchovies, lemon all present and accounted for in a creamy base. It’s the Caesar salad I didn’t know I was missing. Then – the carbonara! Yes, it’s a simple dish. I’ve made it many, many times. But never like this. We all raved about it during the tasting dinner. Jenny and I raved about it again. Rich, creamy. So bacon-y. 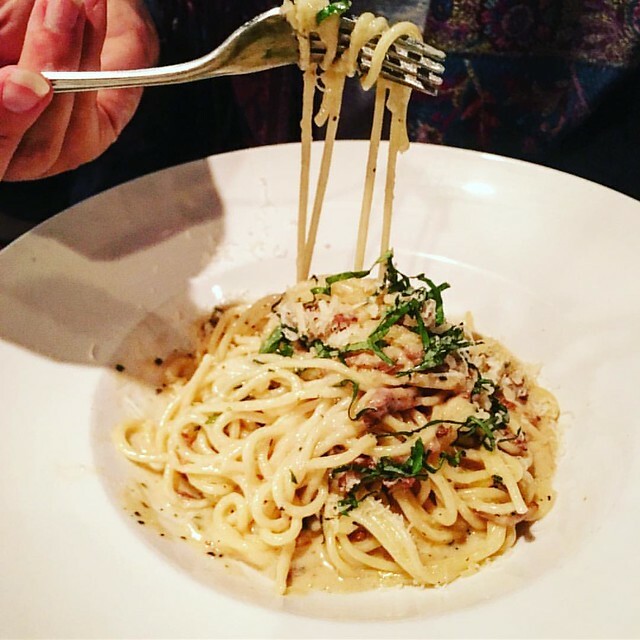 “It’s the best carbonara that I’ve ever had – since three days ago!” Jenny said. To finish, a compromise dessert. Because, Jenny told me, “You like chocolate more than than I do, and I like puddings more than I like chocolate.” So: chocolate mousse. And it was good. Dense. Rich. “Almost like pudding,” she said. This meal was all about comfort food. It didn’t explore new culinary territory. It stayed closer to home. And, it confirmed what the tasting dinner suggested: that Toscano’s Mediterranean Grill is now on my short list of best places to eat good food, local food in our region. And that’s a lovely thing to discover. Toscano’s is a client of hanspetermeyer.ca. While our tasting dinner was paid for by the restaurant, the regular dinner was not. I only write publicly about food and venues I like. That’s been my policy since 2004 when I started writing for EAT Magazine, because that was the publisher’s policy: to elevate that which deserves attention. In my opinion, publishing critical reviews doesn’t help good restaurants get better, it often just flaunts the writer’s ability to complain and be witty. When I have complaints about the food – or any other service or product – I like to speak directly to the server, the manager, or the owner. Every venue has bad days and moments. We can help build a better, more successful food sector (and local economy), by celebrating what’s working. That’s what the #WeAreYQQ brand is all about.